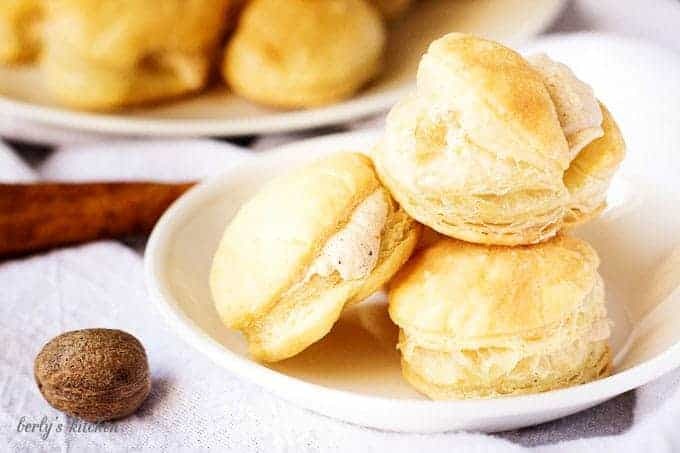 A simple and sweet pumpkin spice filled cream puffs recipe that creates a bite-sized dessert perfect for dinner parties or family get-togethers. We’ve all had those moments when we just want something a little sweet without overdoing it. Sometimes that can be a real challenge. A lot of dessert recipes these days take things a little too far. Even our recipes, like our Peanut Butter Lover’s Pie, can be a bit much. In an effort to provide a reasonable alternative, we decided to share a handheld treat that satisfies your cravings for a light dessert. Before I get into the details of our recipe, let me state, I know these aren’t real cream puffs. The name of this dish is nothing more than a play on one of the ingredients. Since I used a puff pastry sheet for the dough, we used the term cream puffs in the title. I just wanted to get that clarification out of the way before the professionals correct me. Getting back to the dish, pumpkin pie is the main flavor. In fact, the filling tastes just like a slice of pumpkin pie with whipped cream on top. That shouldn’t come as a surprise once you see the ingredient list. Everything you enjoy about the traditional Thanksgiving treat goes into the filling. The best part about the cream is that it’s nothing more than pumpkin spice flavored whipped topping. There are only six ingredients you need to create this offering. The tricky part is injecting the puffs without destroying them. Using a cupcake decorator with an injector tip is a great way to complete this step. The link to ours is listed below. There aren’t any tips or tricks to this recipe. Simply take your time and make sure to let the puffs cool before injecting them. Other than that, you shouldn’t have any issues making this one. In closing, I wish everyone a long life, love everlasting, and a tummy full of delicious treats! First, remove the puff pastry from your freezer at least 30 minutes before starting the recipe. 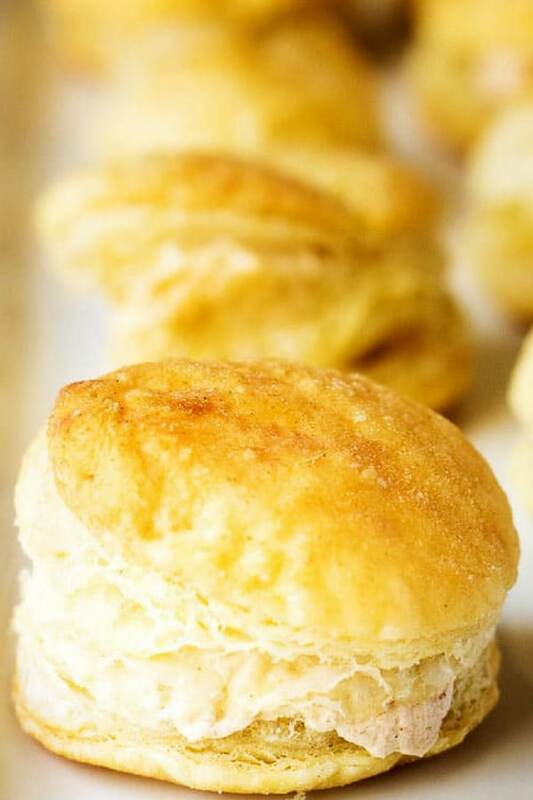 Also, preheat your oven to 400 degrees F.
Next, after the pastry dough has partially unthawed, use a medium biscuit cutter to cut out approximately 12 circles of dough. After that, spray a pan with non-stick cooking spray and place the pastries on the pan. Transfer them to the oven and let them bake for 15 to 18 minutes. 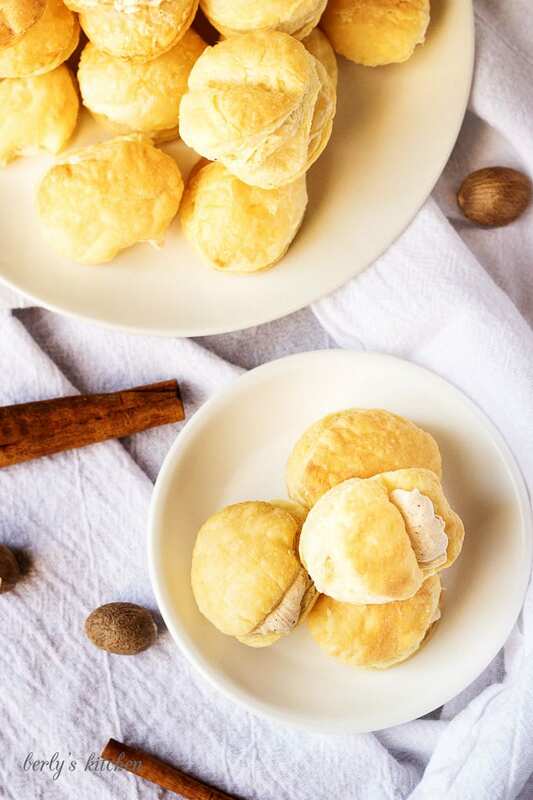 Then, while the puffs cook, use a stand mixer or large bowl and hand mixer, to combine the heavy cream, pumpkin, spice mix, vanilla, and powdered sugar. Whip the ingredients together until they form a pumpkin flavored whipped cream. 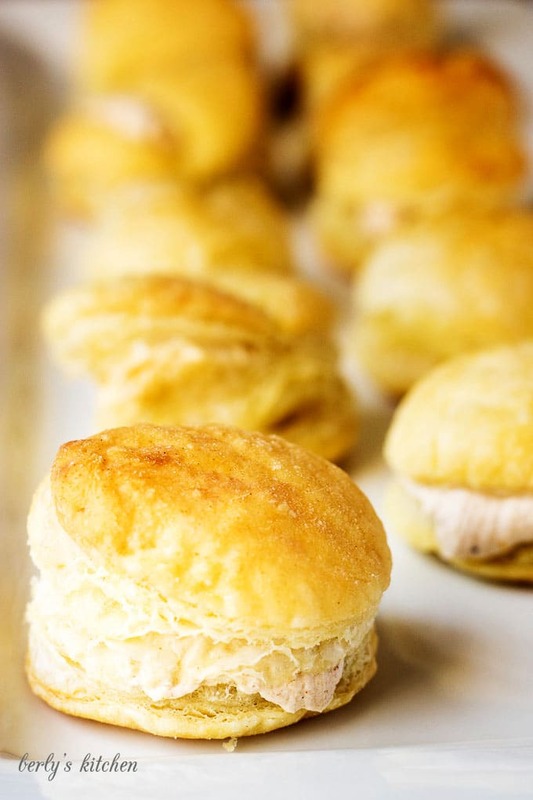 Last, wait for the puffs to cool (about 20 to 30 minutes), then inject the whipped filling to the puffed pastries. Serve fresh, storage of this dessert is not recommended. The calories listed are an approximation based on the ingredients. Actual calories may vary. A serving size consists of three cream puffs. Please allow the pastries to cool before injecting them with the whipped filling. Yum that looks good. Tomorrow is Thanksgiving in Canada. hopefully some will find this recipe in time to get it done! I am always looking for ways to use canned pumpkin. I usually make pies or smoothies. 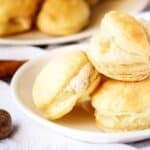 But these cream puffs look delicious. I will have to try to make them soon. I adore cream puffs and pumpkin spice everything but I have never thought of combining the two! YUM! 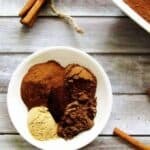 What a great dessert recipe for the fall. 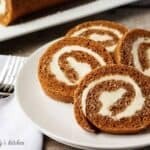 I would love to make these for my family, what a treat for Thanksgiving. I cannot wait to try this and it looks super easy too! I love this time of year because of all of the pumpkin recipes! I know I maybe in the minority but I love them! I’m not that much of a baker but it seems pretty simple, I think I may try this one for my holiday party. These look so light and airy! I love pumpkin and this is the perfect Fall twist on a classic dessert.I’m wishing I could pop a few into my mouth right now! ‘‘Tis the season for pumpkin everything! Lol this looks delicious, especially because I love using puff pastry. Can’t wait to try this out! I adore this time of year for so many reasons–the weather for starters. But there’s the flavors of fall that I adore also. 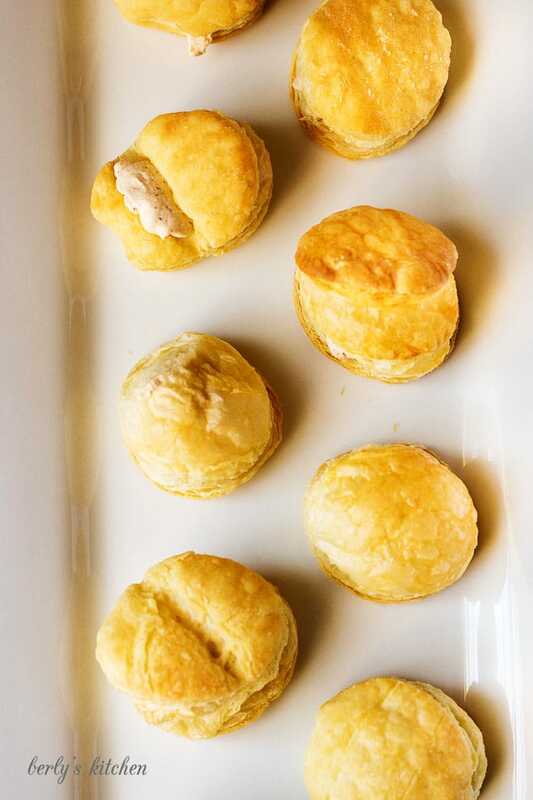 I need to try these pumpkin spice cream puffs. I stock up on canned pumpkin so I’m ready any time a great recipe (like this one) comes along. Oh my these look so good! I have always loved everything pumpkin and when you add in pumpkin spice now you are really talking my love language. I like the looks of these and need to try them out asap! Thanks for the inspiration, we are going to enjoy these! Oh yes please! Good thing you mentioned the part about letting the puffs cool first because that could really make it soggy from the start. These look too tempting! 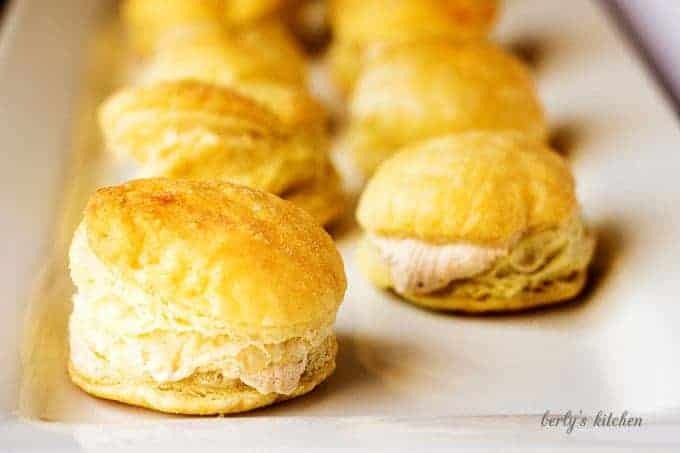 Cream puffs are usually something I have a hard time staying away from! I love fall and everything about it. Pumpkin and apple spice are my two favorite flavors of the season. I can’t wait to try out these delicious looking cream puffs.